End of career He is confronted by Maynard and his army of the Royal Navy, then succumbs to injuries by 20 knives (and 5 gunshots). Edward Teach is a tall thin man. He is not a macho and poseur as are many characters in 99% of books. Apart from captain Johnson (Daniel Defoe) who tended to romanticize his books no book depicts the imposing stature of Blackbeard. He wears a very black beard and a layer of fat on his chest. His body is never clean. He smells like sweat mixed with rum and gun powder. His clothes, torn by many fights, are dark and stained with blood and various beverages. Some captains gave themselves the image of gentlemen dressed in fine rare fabrics, and preferred negotiation. 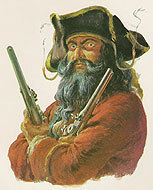 Blackbeard preferred to cultivate the image of fury and a monster. In battle his beard was plaited with tens of mats attached by blood-red ribbons. In battle he used to hang two ignited torches under his hat and hanging beside his face. He did this to terrify his opponents. Edward Teach is certainly an extraordinary leader. He maintains unparalleled discipline and inspires confidence in his men. He knows very well how to navigate through all types of conditions, treat his crew, and maintain their moral high. He has the diplomatic skills to negotiate business with people of high ranks. After a good heist he would bury his chests in a deserted place with the help of one or two men. He returned to the vessel alone. « They stand guard! », he said. It's true, they stand guard, but only as cadavers, as Blackbeard did not like witnesses. » Who is the pirate who collected the most balls and injuries? » Other questions / answers referring to Blackbeard.